If you live in a home with limited space, it’s still nice to be able to offer guests a place to sleep. There most efficient solution is the sleeper sofa or sofa bed. When it’s not in use, it serves as a compact seating space. Sleeper sofas and futons are perfect for dorms, apartments, small rooms, and condominiums. There are a lot of options when it comes to choosing sofa beds, so it’s important to choose the one that will best suit your home, your budget, and most importantly, your comfort. This beautiful sofa bed from Coaster Home Furnishings features white contrast stitching and a comfortable pillow top cushion. The versatile sofa also features adjustable armrests for added comfort. The sofa folds down like a futon and has a durable kiln-dried hardwood frame for stability. The sofa bed comes in four colors designed to fit with most home styles: black, grey, brown, and cream. At 73 inches wide, this sleeper sofa can comfortably fit most people. Starsong’s simple but groovy sleeper sofa bed is a fun, stylish option for your home. The sofa is a whimsical kiwi green color, and the legs stand out in silver. The sofa simply folds down to become a comfortable bed. The design is very simple, featuring classic lines and buttons, which is offset by the fun nature of the green hue. The mattress is of solid foam construction designed with comfort and support in mind. This is another beautiful piece by Coaster Home Furnishings. It comes in a lovely shade of blue with electroplated chrome legs for a sophisticated look. This sofa bed has a unique feature of independently functioning backs. The seating is a very comfortable foam top with a spring base and hardwood frame. For added comfort, there is a pillow top seat and back. 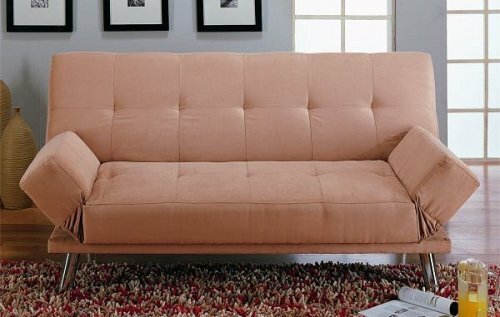 The tan microfiber sofa bed by AtHomeMarket is an attractive and affordable sleeper sofa solution. The microfiber cover is made of the highest quality and is supported by durable steel framing. The sofa features adjustable armrests and a back that simply folds back to become a bed. 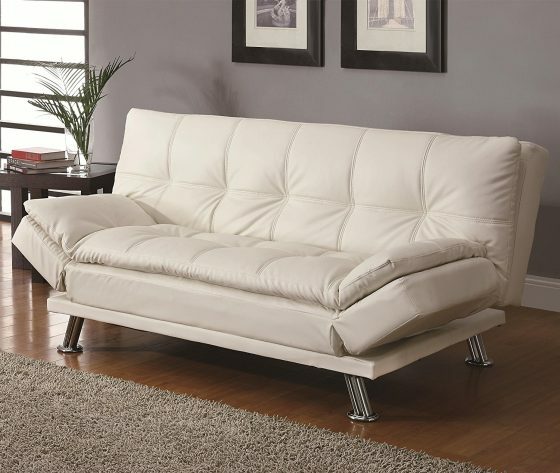 Your sofa bed will fit with many home decors, and the tan cover features simple, classic lines. 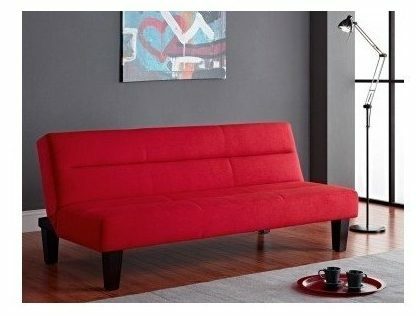 You’ll find this sofa bed an economical, comfortable solution perfect for anyone living where space is a hot commodity. Versatile, Compact. Affordable. Three things you want and need in a sleeper sofa. 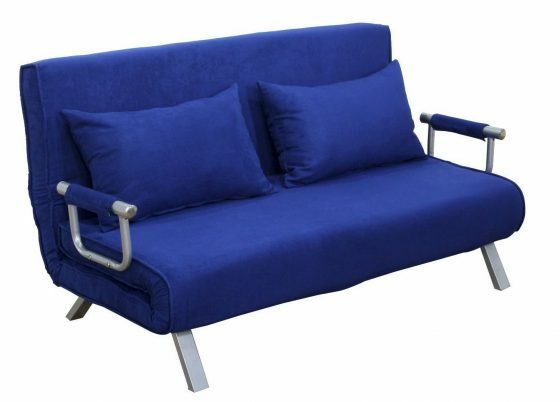 This futon comes in a cheery blue and is perfect for dorms or your first apartment. The futon includes silver armrests, giving it a classic, clean look. You’ll get two pillows for additional comfort. Cleaning is a breeze, as the cover is removable and washable. 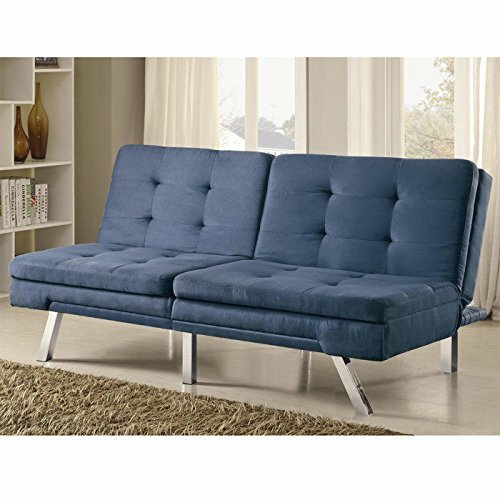 The blue cover is a faux suede covering a cotton inner and is a great piece of furniture for your budget. The Vienna sleeper sofa from DHP is a beautiful piece of furniture designed with comfort and aesthetics in mind. With this sleeper sofa you’ll also get two pillows for added comfort for you or your guests. One feature of all DHP sofas is their easy-to-clean fabric – simply wipe with a damp cloth. You’ll be assured you’re getting a durable product with is wood frame construction, and the faux leather armrests have convenient storage pockets. 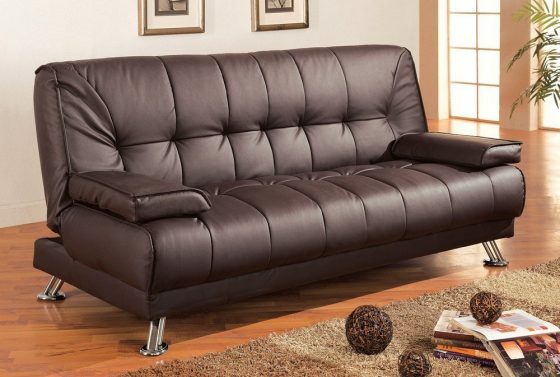 Yet another quality sofa bed from Coaster Home Furnishings, this one comes in an attractive and easy-to-clean brown vinyl. For added sleeping comfort, the hardwood-framed sofa has removable armrests. This one is perfect for most homes and gives any room a sophisticated touch. 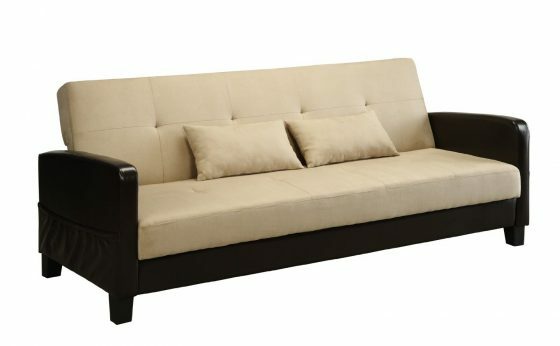 The futon also comes in black vinyl and tan microfiber, so you have a wider range of options to fit any home décor. You’ll also feel added support from the spring backing and foam seating. Make a statement with this beautiful sofa that converts very quickly to a bed. Measuring 69 inches in length, this will only take up a small amount of your precious space. The red microfiber cover is easy to clean and can make an impact in any room of your house, apartment, or dorm. You and your guests can rest easy in style and comfort with this piece from Kebo. You’re getting a fantastic deal with the DHP Sola futon. Not only is it comfortable and stylish in black, it includes storage compartments, adding to the versatility of this piece of furniture. DHP designed this sofa with the space-saver in mind, making this perfect for your dorm, apartment, or condo. The sofa features a black microfiber cover and sophisticated-looking chrome legs. This is another one of DHP’s fine furnishings, and has a sleek, modern look complete with chrome legs. The sofa features a split back and moves easily from sitting to sleeping position. Color and textile options include black and vanilla in faux leather and navy and grey in linen. At 71” wide, the futon can comfortably accommodate most people, and at under $200 is a great value. Like all DHP products, this sofa is easy to assemble; no additional tools required. For many of us, large living spaces are a luxury, so it’s important to maximize our space. Sleeper sofas make it possible to offer sleeping space to guests (or yourself), while taking up very little space, unlike having a guest room. Choose among the best sofa beds and futons to find one to suit your living space, budget, and lifestyle. Rest easy knowing you can find a comfortable seating space that doubles as a comfortable sleeping space for you or your guests.